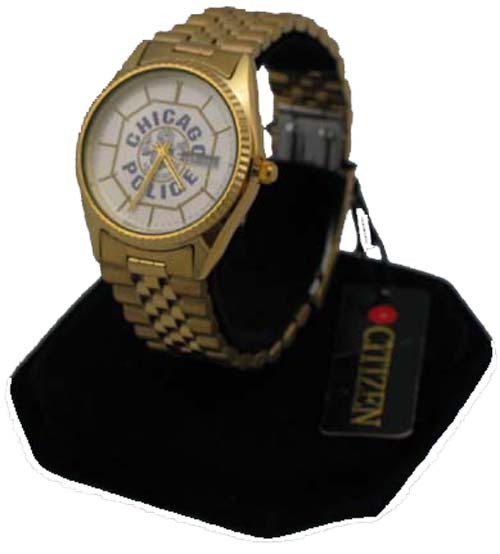 Chicago Police Department Citizen watch with Gold color band. Band can be engraved. This is the perfect gift idea for all who wear their badge with pride. A simply wonderful way to share that pride with loved ones & create your own family heirloom for future generations!We can customize your department so contact us for details. The Oak Lawn badge has applied numbers like the actual badge.Each of our products is custom made for you, so please give us enough time prior to a special occasion to complete your special piece. Please allow 6 weeks for delivery.This is the perfect gift idea for all who wear their badge with pride. A simply wonderful way to share that pride with loved ones & create your own family heirloom for future generations!We will customize the rank.We can customize your department so contact us for details.